An Evening Of Meat Puts Fierce Femininity On The Table… Literally! 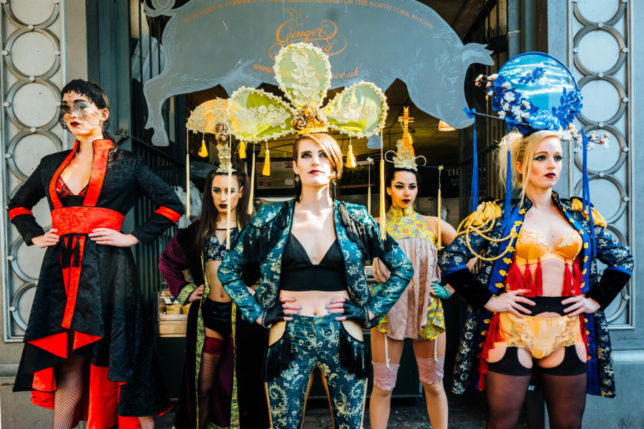 Having launched at The Vaults in Waterloo on the 27th March 2018 and running until the 2nd June, An Evening of Meat is a provocative dinner installation and a unique feast of femininity, where expressive dance and indulgent food meet to thoroughly inundate all the senses. Having gained a cult following across the world from the shores of Sydney to the streets of New York, American multi-hyphenate artist-entrepreneur-director Kate March along with her all-female creative collective, I AM, has brought her unique mixture of choreography, performance art and food to London for a limited run. 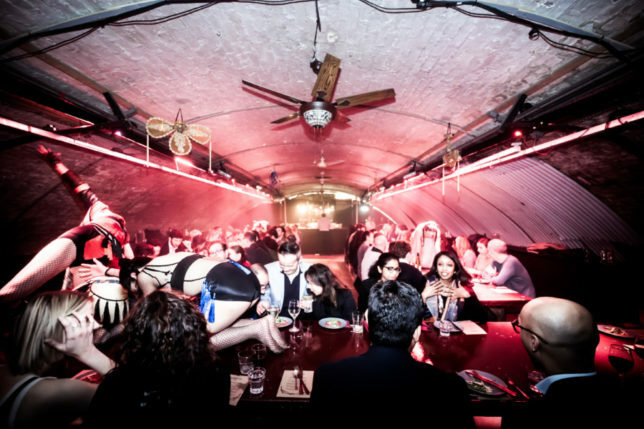 Located close to Waterloo off Lower Marsh, The Vaults can be found at the end of a fairy light illuminated concrete ramp leading down into a grungy grafitti tunnel – this is Leake Street. 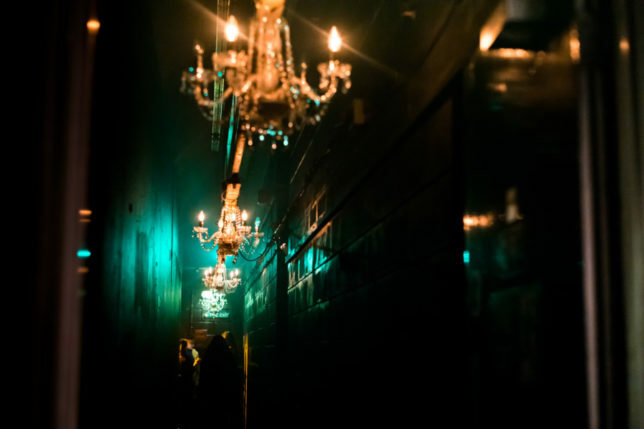 Having navigated past the revellers and the serious looking bouncer, a friendly hostess checks you off the guest list before sending you down a dark tunnel barely lit with flickering chandeliers. The tunnel opens out onto underground lounge such as you have never seen before. Moody lighting illuminates a series of visually arresting wire sculptures by the artist Rachel Ducker. Although featureless, these stunning scupltures take the breath away and raise more questions than answers. 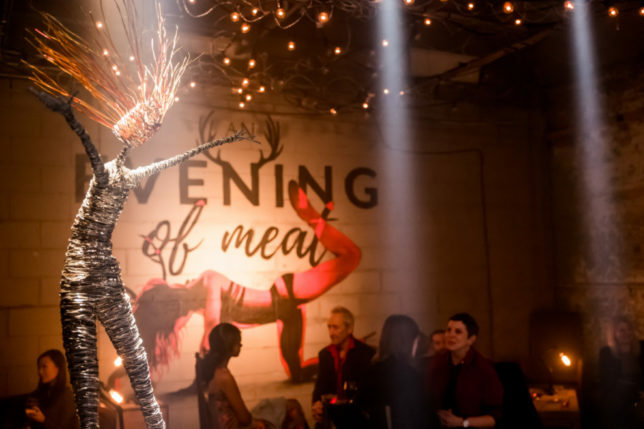 Featuring a fine-dining menu and dancers using a table as a stage, An Evening Of Meat is a powerful conceptual dining experience that explores the all-fours position. As we sat down to enjoy a six course dinner, we were confronted with performers struggling to reach the vertical position. The dancers explore various aspects of the on-all-fours position, such as vulnerability, strength, stability, sensuality, power, domestication, and unbridled wildness. 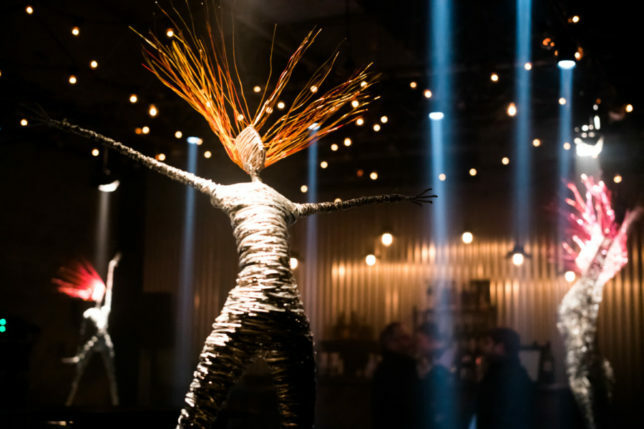 The performers interact with audience through sound, looks and even sips of your drink to build a unique relationship forcing the normally passive audience to become part of the dancer’s internal struggle, creating sometimes uncomfortable viewing and destabilising your sense of self. Is she just a piece of meat on the table? Or is she something much more profound? Kate March’s background in choreography on the London Arts scene first saw her explore the all-fours position by placing female performers on dining tables to create an innovative and forceful collision of worlds of performance, fashion and gastronomy. 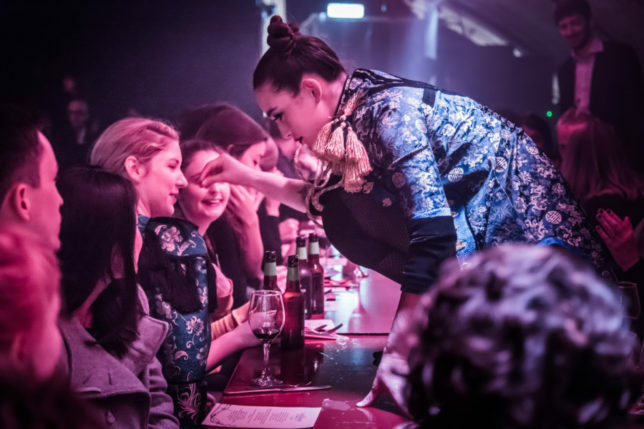 Her unique conceptual dining experience has reinvented ‘dinner theatre’ all around the world by allowing her to engage with diverse audiences and experiment with innovative concepts. 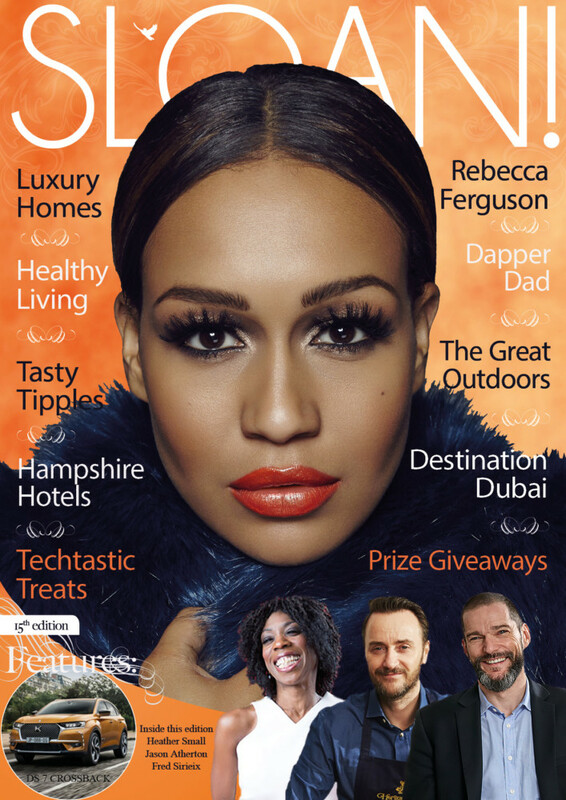 Having now returned to London, she shares her creative evolution with a new audience at The Vaults where the performance is loud, proud and most certainly in your face. 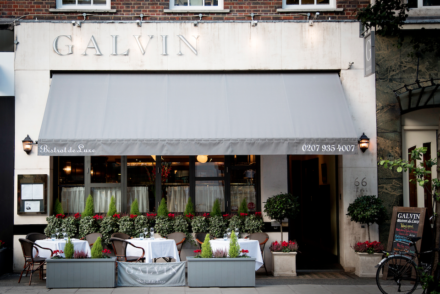 As far as the dining goes, An Evening of Meat features a six-course tasting menu which is thankfully strong enough to balance the fierce females demanding your attention as they move across the tables. 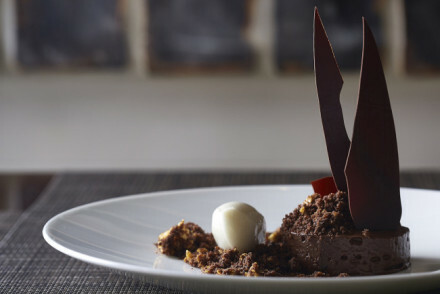 Created by Head Chef Chavdar Todorov, who has trained in some of the best Michelin starred restaurants, every dish has been designed to tempt and tantalise the senses. 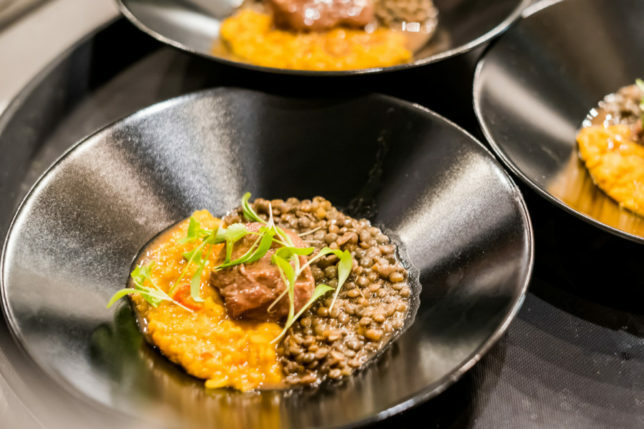 It goes without saying that there is a strong focus on meat but our vegetarian friends have not been forgotten as each course also has a vegetarian equivalent available. Starting with an amuse bouche, we were served mini savoury cone filled with a bite of chicken liver (or mushroom parfait) topped with a spiced beetroot glaze and walnut crumb. 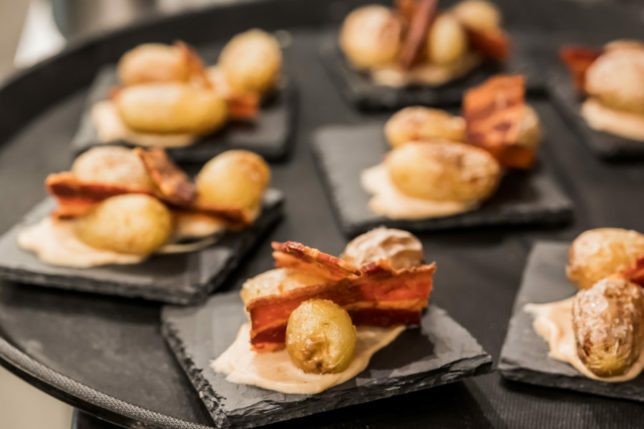 As the performance gets underway, slates carrying salt baked baby potatoes are brought out served with a smear of yeasty beurre noisette and crisp pancetta for the carnivores. 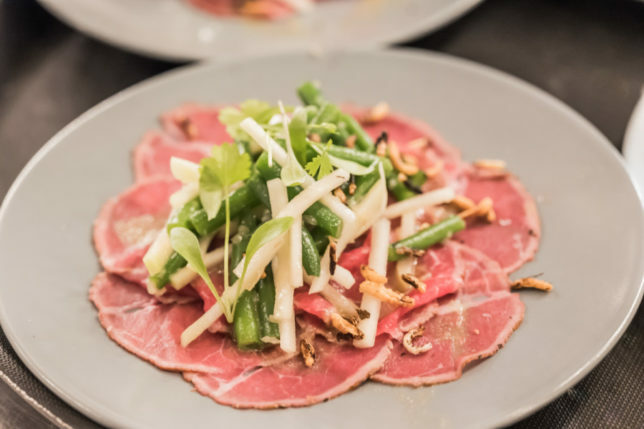 The next dish is seared carpaccio of dry-aged tender beef with kohlrabi, haricot verts, puffed rice and a thai dressing. Non-meat eaters can opt for three day prepared seedless watermelon. 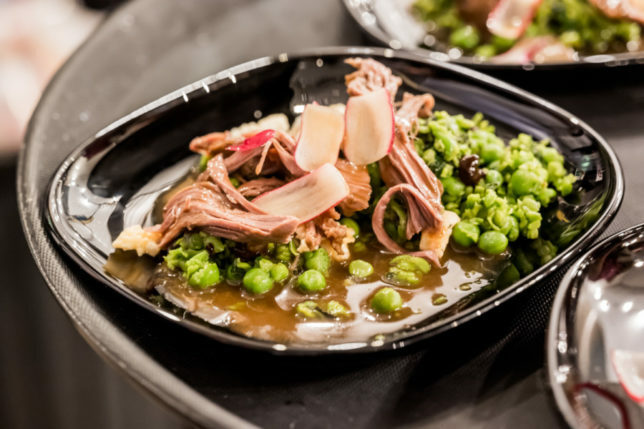 As the energy builds with the dancers banging tables with their hands to demand attention and playing out girl-on-girl power struggles, we are served pulled mutton shoulder slowly braised (or miso glazed aubergine for the veggies) with sweet garden peas and spearmint, 14 day fermented black garlic mustard, dehydrated feta, pea shoots and charred wild garlic. The performance has got loud and visually arresting by the time we are served rare breed pig cheek oyster which purports to be melt-in-the-mouth but requires a tad more chewing than that implies. This is served on a bed of side by side lentils – a gently spiced red dahl which is delicious and a herby Puy (good but not amazing). Joining them on the plate is a spoonful of citrus gremolata which pairs well with the pork. For the vegetarians, there is the option of daikon radish slow-cooked in orange juice instead of the pig cheek oyster. 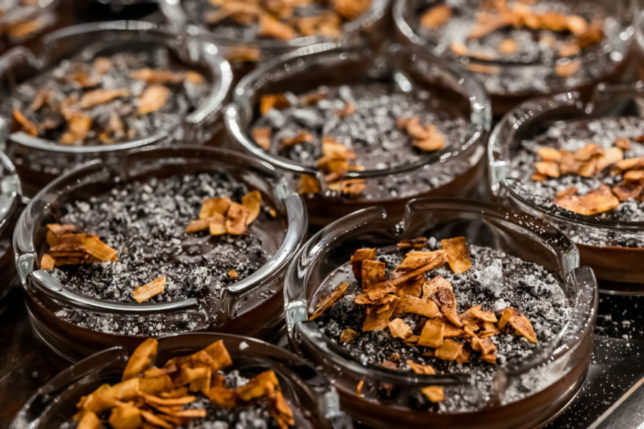 As the performance reaches its climax and the dancers are finally standing up in championing their girl power and ferocious femininity we are served dessert of 70% Guanaja chocolate and olive oil ganache dusted with sesame ash, coconut flakes (which look and taste like bacon) and vanilla smoked salt. As much about fashion and music as it is about food, An Evening Of Meat has seen I AM collaborate with Singapore-based designer, Lisa Von Tang on costume design and LA-based composer, Patrick Rivera, on an entirely original music score for the show. 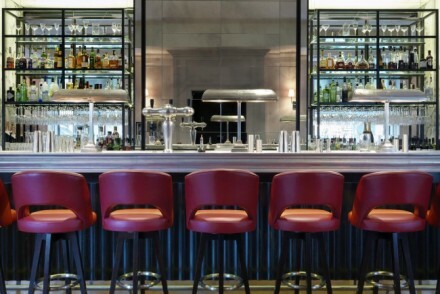 Following the show, guests are invited to stay behind and enjoy a cocktail in the relaxed and intimate bar area. The critically-acclaimed show has wowed audiences in Sydney, Hong Kong and Berlin with its innovation and expression. 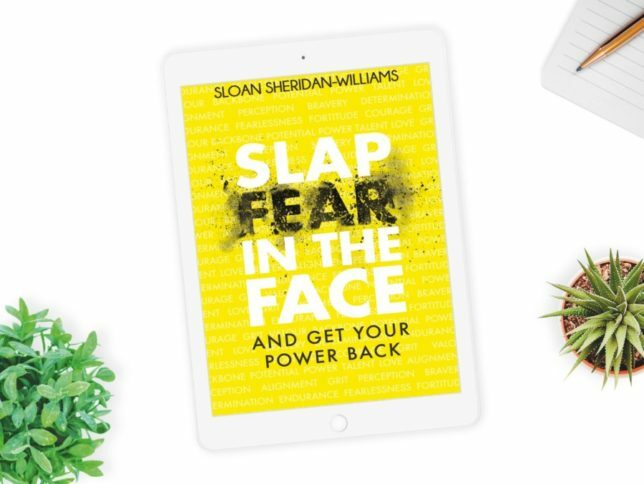 London audiences can expect to be equally blown away by the choreography and passion of the performance which will leave you not knowing quite where to look or how to act faced with these violently expressive females. However as the night goes on, you can be sure to be left in no doubt by this surreal experience that nobody is a piece of meat… maybe that explains why the vegetarian options sound so tasty!